Athletic Director Mark Conroy took the podium on November 29 to congratulate Williston’s outstanding athletics programs, and to give special recognition to a handful of award winners who excelled during the fall season. Conroy recognized four students, Aidenne Alden, Alex Foster, Momoka Oda, and Villard Xu, participants in the school’s horseback riding program, which trains at Fuller Horse Farm in Westhampton under the direction of Laura Etzel. “Coach Laura Etzel says that the group was a great pleasure to work with, improved tremendously this fall, and are getting close to being able to compete in the spring season,” Conroy said. These career totals, Conroy noted, include 45 touchdown passes and throwing for 4,310 yards. Several players earned postseason recognition for their outstanding play during the season. Austin Ryan, was named to the prestigious All New England team by the NEPSAC football coaches association. Additionally, three boys were named Erickson League all-stars: Austin Ryan, Nate Balthazard, and Brandyn Jones. On the Junior Varsity football team, the Most Valuable Player award was given to Ben Normandin ’19; the Most Improved Player award was given to Tad Daley ’20; and Josh Holmberg ’18 earned the Sportsmanship award. “Jim Purce Memorial” Award for Overall Excellence – Ian Ostberg ’17 (2nd year in a row); “Edward Stimets Jr. Memorial” Defensive Excellence Award – Derek Zewinski ’17 (2nd year in a row); “Lindy Hanson Memorial” Offensive Excellence Award – Nate Balthazard ’17, Austin Ryan ’17; “Richard R. Francis” Most Improved Player Award – GB Osuntogun ’18; Mills Kicking Game Award – Elijah Hutchinson ’18; Sportsmanship Award – Hunter Adams ’17, and Dome Klonggumrai ’17. Next year’s captains will be Mason Balch ’18, Noah Clack ’18, Brandyn Jones ’18, and Xavier Thibault ’18. “Led by Coaches Rivenburgh and Berlanga, the JV volleyball team had one of their finest seasons in recent memory with seven wins, including two thrilling 2-1 victories over Suffield and Miss Porters,” Conroy said. The varsity team, led by Coaches Schneider and Moyer, “improved significantly and played competitive volleyball all season,” Conroy said. He noted several highlights, including a 3-1 road victory at Berkshire, a great team effort shutting out Stoneleigh Burnham 3-0, and a comeback victory over Worcester 3-1 late in the season. The Most Valuable Player award went to Karen Janocha ’19; Most Improved Player went to Alexis Parker ’19 and Hana Tsukamoto ’20; the Sportsmanship Award went to Zoe Okaisabor ’19. On the Varsity team, awards were given to Sarah Marion ’17 for Most Valuable Player; Most Improved Player went to Danielle Marquez ’18; the Sportsmanship Award was given to Julia Cavanaugh ’19 and Kai McCalla ’17. Next year’s captains will be Lizzie Cuevas ’18 and Dani Marquez ’18. Led by Coaches Bill Berghoff and Adeleen Brown, the boys’ water polo team played competitive polo all fall, and benefitted from “terrific senior leadership led by captains Noah DeVos and David Fitch, and four year veterans Sitai Chen and Mark Wei.” These players helped the squad sweep Wilbraham & Monson Academy in all three of their matches. Junior David Janoschek capped off a terrific junior year by being named a Second Team NEPSAC all-star. Water polo awards went Noah DeVos ’17 for Most Valuable Player (his second year winning the title). Most Improved Player Award went to Sam Haddad ’20; and the Sportsmanship Award went to Sitai Chen ’17. Captains for next year will be Josh Calianos ’18 and David Janoschek ’18. The JV soccer team, led by Coaches Tom Johnson and Ellie Moore, had an excellent season, finishing with a 9-5 record including six shutouts and exciting victories over Suffield, NMH and Berkshire. The Varsity squad, under Coaches Fulcher and Conroy, “made great strides this season,” Conroy said. Captain Molly Zawacki and junior Sophie Weed both were named to the WNEPSSA all-star team while Sophie also made the NEPSAC Class B all-star team. On the varsity team, Most Valuable Player went to Fiona Bundy ’18 and Sophie Weed ’18; Most Improved Player Award went to Julia Farnham ’20; Natalie Romain ’18 took the Sportsmanship Award; and the Alumnae Award for outstanding contribution to the program went to Molly Zawacki ’17. Next year’s captains will be Fiona Bundy ’18 and Madison Fulcher-Melendy ’18. Sophomore Cory Booth and junior Jack Phelan were both named to the Western New England prep all-star team; senior George Lantz was named both a Western NE All Star and a NEPSAC All Star. Awards went to Kyle Grabowski ’20 for Most Valuable Player; Most Improved Player Award was given to Jacob Schulkind ’21; and the Sportsmanship Award went to Dylan Robinson ’22. On JV B, the Most Valuable Player award went to Owen Randolph ’19; the Most Improved Player Award went to Ethan Huang ’20; and the Sportsmanship Award went to Finlay MacDonald ’20 and Aidan McCreary ’19. On JV A, the Most Valuable Player Award went to Jonathan Toth ’20; the Most Improved Player Award was given to Reilly Gluz ’19; and the Sportsmanship Award went to Ryan Dwyer ’19. The varsity squad gave its Most Valuable Player Award to George Lantz ’17; the Most Improved Player Award went to Zuri Campbell ’19, and John Killcommons ’18; and for the second year in a row, senior Saul Blain took home the Sportsmanship Award. Senior Sebi Herrera earned the 12th Player Award. Next year’s captain will be Jack Phelan ’18. The Varsity Field Hockey team, led by Coaches Kate Garrity, Alex Tancrell-Fontaine and Ellie Massengill, finished with a record of 6-9-1 including a 5-2 Class B record. Conroy noted team highlights including included an overtime tie with Taft, a “beautifully executed game” against St. Mark’s that the team narrowly lost 2-1, and new varsity goalies Gabby Dicomitis and Kira Bixby combining for four shutouts on the season. Two juniors, goalie Gabby Dicomitis and forward Tori Palumbo, were named to the Western NE All Star team. On the JV team, Emma Prouty ’18 took home Most Valuable Player; Most Improved Player Award was given to Casey Feins ’20; and the Sportsmanship Award went to senior Grace Quisenberry. On the varsity field hockey team, Tori Palumbo was named MVP; Madison Cardaci was named Most Improved, and Hannah Baker took home the Sportsmanship award. Next year’s captains will be Caroline Channell ’18 and Tori Palumbo ’18. Led by Coaches Greg Tuleja, Martha McCullagh and Mia Smith, the Girls Cross Country team had “another terrific season finishing with a record of 10-3,” Conroy noted. As a side note, Conroy said the girls’ cross country team has had a winning record 30 of the last 31 years. Four current runners made their way onto this course’s Honor Roll, Natalie Aquadro, Maya Soley, Claire Harrison, and Abigail Tuohey. The Most Valuable Runner award went to Abigail Touhey ’22, the first 7th grader ever to receive the recognition. The Most Improved Runner went to Nikki Foster ’20 and Claire Harrison ’19; and senior Gabby Mercier took home the Sportsmanship Award. Next year’s captains will be Anabelle Farnham ’18 and Maya Soley ’18. Under the direction of Coaches Talbot Syfu, Loomis and Gunn, the 35 member Boys Cross Country team, the boys’ cross country finished the season with a 12-1 record, its only loss coming from Division I powerhouse NMH. During the season’s annual meet with KO and Westminster, senior Nick Hill ran the second fastest time ever on our home course with a 15:54. 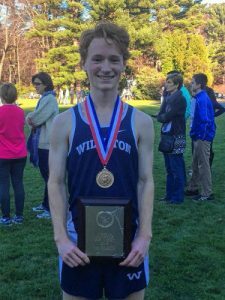 In a “decisive victory at Avon Old Farms,” senior Billy Ashenden won his first ever race. For the second consecutive year, the team won the Westminster Invitational; senior Nick Hill had a tremendous day by winning the race while setting a new meet record. Fellow senior teammates Tyler Greenwood and Billy Ashenden finished in 7th and 8th overall. The JV team, led by Andrew Spiegel’s second place finish, took second place. This finished a tremendous career for Nick as he won numerous meets, won the Westminster Invitational in a meet record, and in the words of Coach Talbot Syfu ‘was a tremendous leader for us. His passion for running and leadership had a tremendous impact on the entire team,’” Conroy said. The “Alan Shaler” Most Valuable Runner award went to Nick Hill ’17; the Most Improved Runner award went to Oscar DeFrancis ’20 and Caleb Stern ’19; the Sportsmanship award went to Tyler Greenwood ’17 and Nat Markey ’20. Next year’s captains will be Rob Champigny ’18, Oliver Lawrence ’18, and Bryan Soder ’17.